I have also this model Velodyne Acoustics CHT-8 i bought this sub from one chapri at very cheaper price and The difference was remarkable! i m very impressed ......... Installation was quick and easy The smooth lows and powerful punches enhanced my home theater and is miles better than my old kenwood sub.... ...if your system’s sounding a little bass-light, then the CHT 8 is a solid performer. I would recommend the CHT 8 Subwoofer to anyone who wishes to upgrade their home theater system without emptying your wallet. rock ur theater. I have been very impressed with this sub. It compliments my magnepan mg3a's very nicely. I picked this sub up from a guy that was trying to pawn it but they wouldn't take it (their loss). I paid him $20 for it and have been pleased with my purchase ever since. It hs very tight and musical bass. It keeps up with the maggies very well. The only problem that it has is that it falls on its face when confronted with very deep bass. But what can you really expect from a 8" sub. If you find one for less than $100 I say that you should buy it, because you won't regret it. after buying sapphire st2 and center i wanted a small sub just to fill the room in . went to circuit city and they had an open box cht-8 for 150 ( what a steal ) asked the kid to hook it up for me just to make sure it was good to go , well it was !at this time i need to be carefull when listen to my system because i do not want to crack the fondation under my house . sapphire st2 rock do not get the st1 spend the extra money it is must . You will not find one. I used the infinity entra 2 for several months and liked it fine. Then I heard this little sub at circuit city. I was very impressed for the deep bass I was hearing from such a small enclosure. I gave the infinity to my father and began picking this little thing apart. Going from a 12" to 8" driver meant re-tweaking my system. This sub is capable of playing very fairly deep. It will play just as deep as the infinty. When dissasembling the unit I found the enclosure to be very sturdy. The front baffle will not vibrate at high volumes. The driver itself is very beefy. The motor assy on the driver is very large. The enclosure itself is not very large, but is pretty heavy for the size. I currently use this sub in a 6.1 set up along with the Klipsch KG4.2's (mains) The sub seems to have an overdrive circuit of some sort that keeps it from bottoming out at high volumes. Over all I have been impressed with the cht 8. It will shake a small house with ease if desired, but if set up correctly it will create a very nice listening experiance. Very strongly recommended. 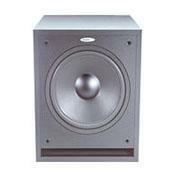 This is my first subwoofer so I don't claim to be an expert. I listened to the klipsch ksw10 and just loved it,however the price tag was to much for me. So I took a chance on the velodyne cht-8 after reading reviews. I dare anybody to find any 8 inch sub that is better than this one,I bet it can blow away a lot of ten inch subs. It is very musical so its great for playing music also. I only have it turned up halfway, boy does velodyne know how to make a sub. You won't be dissapointed if you purchase this sub. This is a great little sub. I was having a tough time deciding between the new DLS-3500 and this sub. When I found an open box deal at Circuit City it was a no-brainer. Took it home, hooked it up, and impressed even my wife. Don't be fooled by the little 8" cone. This sub put's out some sound that is more than plenty for your "average-sized living room. They had it turned on in the store with Gladiator playing and when I first heard the bass, I thought it was a 12" sub. Needless to say I am very pleased. Velodyne has been building subs for a long time and they certainly got it right IMHO. Strong ,clear sound for an 8 inch,much better than any 8 inch sub I have heard! Wow,What a pounding sub....and musical at the same time. I have its BIG brother (CHT15) for the LFE channel and I am using this 8 incher for the rear surrounds (which makes all the difference in the world if you have not tried this). Very loud and clear with no "chuffing" noises as I have read about with the CT-8 version. Recommended!